Newly crowned Miss Navajo Nation 2011-2012 Crystalyne Curley from Fish Point, Ariz., speaks to the crowd as her fellow contestants stand behind her Saturday evening in Window Rock. The nervous energy fell to complete silence then erupted at the moment Crystalyne Gayle Curley was announced as winner of the 2011-12 Miss Navajo Nation pageant. Curley, 25, won the crown Saturday evening in front of a large audience at the ceremony, held in a tent behind the Navajo Arts and Craft Enterprise, pageant sponsor. "I'm so speechless right now and I'm so very proud," Curley said, as tears streamed down her face during her acceptance speech. "I came from a very, very hard road. I live in a community where there is no water, where there is no electric and we have really bad potholes, BIA roads." Curley, of Fish Point, Ariz., is the daughter of Marilyn and Ray Curley. She is Tsenjikini (Cliff Dweller Clan), born for To'aheedliinii (Water Flowing Together Clan). Her maternal and paternal grandfathers are Kinyaa'aanii (Towering House Clan). She is the eldest of five children, and her siblings include Lisa, Cheryl, Leander and Ravenna. "I cannot explain my feelings, its unbelievable," Marilyn Curley said seconds after finding out her daughter had won the title. "I'm just very happy right now." "I had a feeling already," added Ray Curley. "I'm excited and happy for her." In addition to thanking her parents, Curley also thanked other family members for being there for her during the competition and said camping out was not a problem for them because "that's how we live out there." Curley, who lives in Cottonwood/Tselani Chapter, is the second Miss Navajo Nation from the area, which lies southwest of Chinle. She joins former Miss Navajo Nation 1996-97 Josephine Tracey, who said Curley deserved the coveted title. "Her heart really did pay off," Tracey said, adding that she's excited the crown is back in the Central Agency after two years away. "She was serious and determined." Tracey said Curley's description of the lack of basic infrastructure in the Cottonwood/Tselani area is true. Despite the conditions, Tracey said, Curley can draw strength from the community, which will be 100 percent behind their new Miss Navajo Nation. Curley's path to the crown included some stiff competition from nine other contestants. 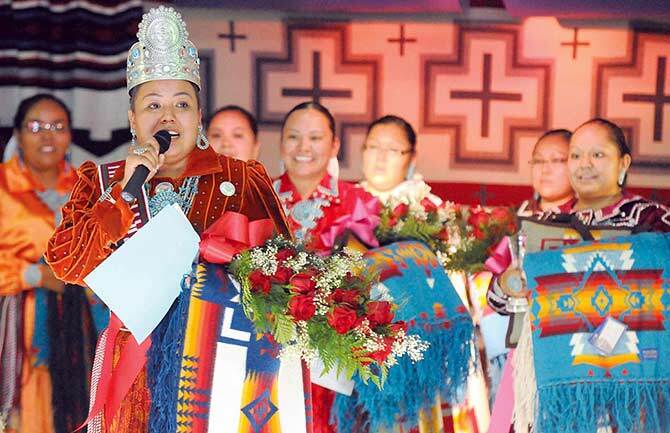 Ambra Sue Nez of Leupp, Ariz., was named first runner-up and Ann Marie Salt of Kayenta was second runner-up. The Miss Congeniality award went to Brenda Begay of Many Farms, Ariz., and Emerald Dahozy of Fort Defiance won both the Miss Photogenic and Best Essay awards. Curley was also named the best sheep butcher among the contestants - an honor three of her ma yazhis (maternal aunts) were very proud she won. "She practiced for a year," said Mary Burbank, who taught her niece how to butcher. "We're mutton lovers," added Lavelle Burbank. "All our hard work and tiredness was worth it," said Cina Francis, another aunt. "It feels awesome!" Contestants were evaluated for their responses to a panel of interviewers, their butchering and fry bread making skills, and command of contemporary and traditional talents and skills. During the traditional competition, Curley demonstrated and explained in Navajo the process of making kinaalda cake and performed a ribbon dance song she learned from Brent Chase of the Corn Pollen Trail Dancers. Curley was also one of the few contestants well versed enough in her native language to respond in Navajo to questions. She was asked in Navajo to describe her own kinaalda, a puberty ceremony for young women. "I'm 'almost' fluent in Navajo," added Curley, who is relearning Navajo after picking up English as her second language. For her contemporary talent and skill, Curley made a vegetable and fruit bouquet and sang "Go My Son" while signing the lyrics in American Sign Language. Curley said she chose these skills to emphasize the importance of healthy eating and to remind young people about the importance of attaining higher education. Curley, a first-generation college student and Gates Millennium Scholar, holds two bachelor's degrees from Arizona State University, in psychology and justice studies. In an interview Monday, Curley said she felt cool, calm and collected during the competition. "I kind of put it in the Lord's hand," she said. A member of the Black Mountain Mennonite Church, Curley added, "I do believe things happen for a reason." Curley said she also drew strength from her late grandfather, Kee T. Yazzie, who instilled in her the traditional teachings and philosophy of the Navajo way of life. "He always told me to run for Miss Navajo," Curley said. "And I would be like, 'Me?! Ahhh, I don't know.' That was his dream." As Miss Navajo Nation, Curley plans to do her best to empower young Navajos through instilling self-confidence, self-respect and cultural identity - which she considers indispensable for survival in today's world. Because young people are easily bored, she said, she plans a multi-pronged approach that will include hands-on activities like volunteering, sporting events, scholarship workshops, and peer tutoring in Navajo schools. The tutoring plan is dear to Curley, who tutored high school students on the Salt River Pima-Maricopa Community near ASU for five years, served as a summer bridge mentor at Central Arizona College, and tutors fellow students at ASU. She has aspirations of attending graduate school and becoming a counselor one day. "Anything is possible, especially if you really believe in yourself - love is a big factor," Curley said. "If you don't have love, you don't know how to respect yourself and those around you." Asked how the Miss Navajo Nation title compares to others she has held, including Miss Inter-Tribal Indian Ceremonial 2008 and third runner-up for the 2011 Miss Indian World, Curley said, "This one really hits home. It's the most precious one. It's powerful to have this and really stand ground for your people." Curley said she is going to use the new $18,000 crown she recently acquired as a teaching tool wherever she goes because it's adorned with the history of the Navajo people from the emergence to current times.